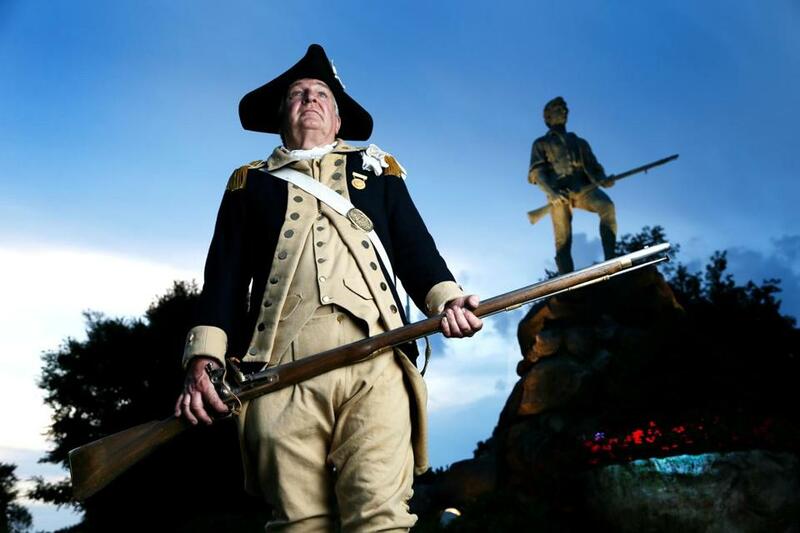 Bill Delay, a descendant of a Minuteman, was one of 37 subjects for Damian Strohmeyer. As one of the most historically significant communities in the nation, widely recognized for its pivotal role in the American Revolution, Lexington has a tendency to look toward the past. But as the town continues rolling out its yearlong tricentennial celebration, one participant is decidedly focused on the present. Photographer Damian Strohmeyer, best known for his more than 60 Sports Illustrated covers, volunteered in mid-2012 to turn his camera lens toward the people of Lexington today. His contribution to the town’s 300th anniversary celebration, an exhibition of 37 photographs called “Faces of Lexington,” is on display this month at the Cary Memorial Library. For Strohmeyer, that regular schedule over the past year included shooting NFL games, baseball playoffs, and college sports. Helping Strohmeyer with the logistics of the shoots were his teenage son, Zachary, and his regular assistant, Michael Clarke. Strohmeyer’s wife, Globe photographer Joanne Rathe, helped him to clarify the artistic vision behind the project and figure out some of the technical aspects of the shoots. The range of subjects in the exhibition reflects the constantly evolving demographic of the town, Strohmeyer said. He photographed Polly Kienle, a Minute Man National Historical Park ranger, and Bill Delay, a direct descendant of a Revolutionary War soldier who can trace his ancestry to the Mayflower, but Strohmeyer also included such subjects as a 16-year-old skateboard fanatic; the cocaptains of the Lexington High School football team; and a family of Chinese immigrants. The oldest subject was a 100-year-old Red Sox fan, Ruth Doran, who died shortly after the shoot; the youngest was infant Ronan Patel, the Lexington resident born closest to the town’s 300th anniversary date. “I met a lot of interesting people through this project,” said Strohmeyer, who has lived in Lexington for 22 years. “The first subject was the manager of Lexington’s semiprofessional baseball team. I photographed him on a beautiful foggy morning at the baseball field in the town center. Then I shot a member of the Daughters of the American Revolution and one of the town’s last remaining World War II veterans.” He included a yoga instructor, a real estate agent who founded the 1980s band Buffalo Tom, and students from the high school’s special needs program. His photos are on exhibit through Jan. 31 at Cary Memorial Library, 1874 Massachusetts Ave.. For hours and more information, call 781-862-6288 or go to www.carylibrary.org. WAX PAINTING: “Breaking Boundaries: An exhibit by the artists of New England Wax” opens Thursday and continues through Jan. 26 at Fountain Street Fine Art, 59 Fountain St. in Framingham. An opening reception and jurors’ talk will be held Saturday from 5 to 7 p.m. The exhibition encompasses recent work from New England artists in the ancient medium of encaustic, or wax, painting. For more details, call 508-879-4200 or go to www.fountainstreetfineart.com. LOCAL LANDSCAPES: Now showing at the Zullo Gallery in Medfield is the First Inness Invitational Landscape Exhibition, with an artists’ reception Saturday from 6 to 8 p.m.
Named after George Inness, a renowned landscape painter who lived and painted in Medfield in the 19th century and whose images of the local countryside remain icons of the New England landscape, the show features two of today’s most prominent landscape painters, Dennis Sheehan and Christina Beecher. The Zullo Gallery, at 456A Main St., is open noon to 5 p.m. on Saturdays and Sundays. NOW YOU SEE IT: The Regent Theatre in Arlington kicks off its annual Magic Month on Saturday with a four-week series of Saturday morning shows featuring different musicians. Highlighted this weekend is Matias Letelier, whose family show is titled “The Magic of the Imagination.” Other featured guests are Bob the Magic Guy with “Magic for Smart People” on Jan. 11, Matt Roberts with “Laughs and Illusions” on Jan. 18, and David Garrity’s one-man illusion show on Jan. 25. All shows are at 10:30 a.m. at the Regent, 7 Medford St.; admission is $10 for adults; $8 for children and seniors. For advance tickets or more information, call 781-646-4849 or go to www.regenttheatre.com. HEALTHFUL EATING: Kristi Marsh, author of “Little Changes: Tales of a Reluctant Home Eco-Momics Pioneer,” will discuss her book Monday at 7 p.m. at the Newton Free Library as part of the Green Decade/Newton organization’s Greening Our Community speaker series. Marsh, the founder of the Choose Wiser website (www.choosewiser.com), became an advocate for more stringent environmental standards after being diagnosed with breast cancer.